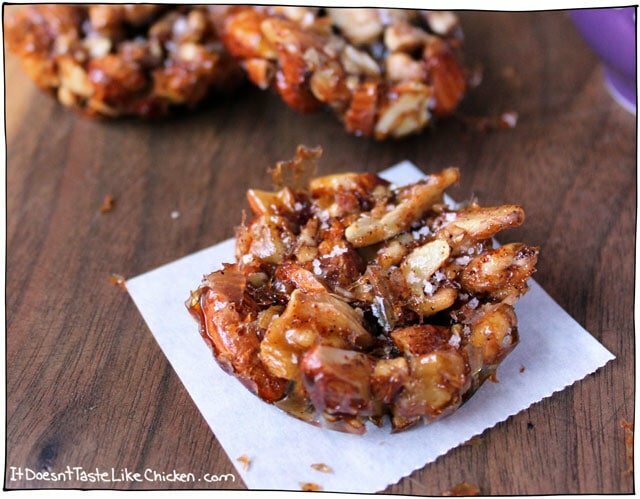 5 Ingredients + 10 minutes to make nutty, salty, mapley clusters = YES PLEASE! Saturday: I awoke by sitting bolt up right in bed and shrieking, SNOW!? Terror. Even though I live in Toronto, where we spend almost half the year covered in snow, the first flakes are always a shock. The day didn’t get much better from there, disappointing waffles, and a failed sweet potato pie. –Pie crust, you are my nemesis- The day was pretty much a wreck and left me pouting around the house. (I’m not at all a baby or over dramatic or anything). 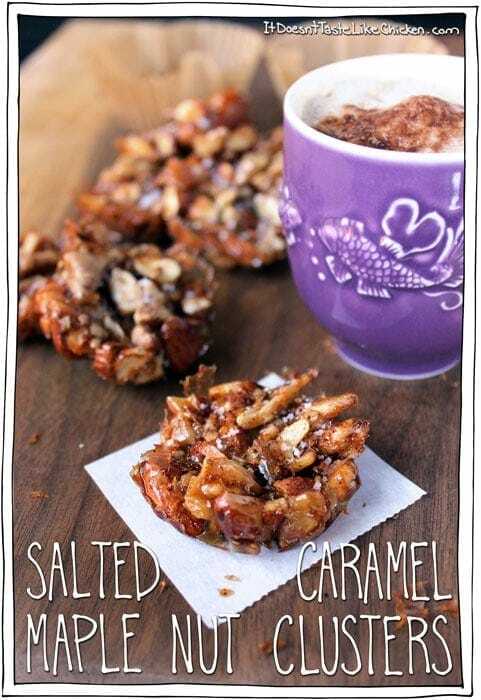 Sunday: Daylight savings time gave me an extra hour to sleep in, I woke up to a beautiful sunny day, and enjoyed a super creamy soy latte while I created these Salted Caramel Maple Nut Clusters. Not only did these bad boys work out shockingly perfect (like really, it’s kind of shocking that they stick together like they do), but they were delectably crunchy, sweet and salty. I went for a long, crisp walk on the beach (yes, beach and snow are in the same story), and then I created another successful recipe of Creamy Potato Soup, Sunday was looking mighty fine. Sunday, we can be friends. Two more exciting things happened this week, it’s hard to beat the excitement of Maple Nut Clusters, but here we go, exciting thing number one: I officially became a published author! Something I never thought I would be. Like really, never. I’m not a fan of writing, or English, or speaking. I think speaking is my second language, not sure what the first is. My high school English teacher Mr. Mason, even wrote on my report card “Samantha is the best actor in our English class”. Well, at least I was good at acting like I was good at English… right? I realized that when I started writing about something I love → vegan food ← It’s not only super fun, but kind of my favourite thing ever. So here I stand, (well sitting currently) all published and proud. You can check out my article (originally seen here) on How to Cut a Mango in the latest issue of Healthy Juicing Magazine. 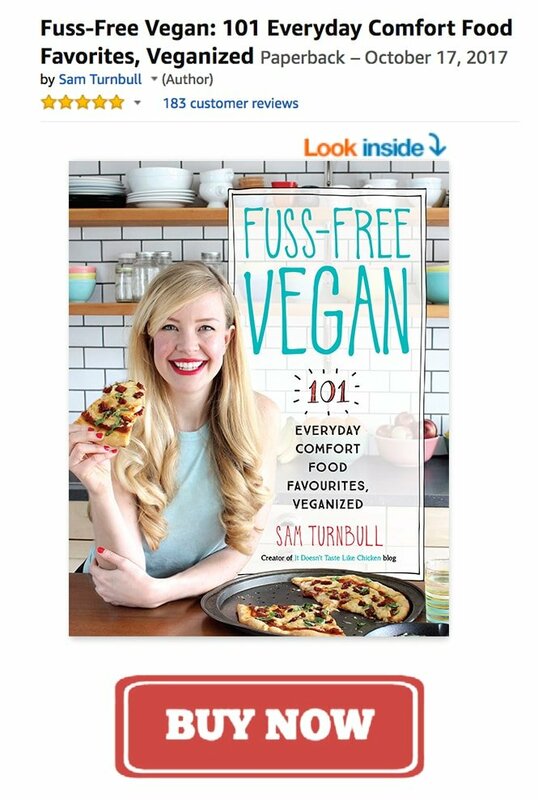 Exciting thing number 2: I’m featured as a a Cooking Superstar (I’m blushing), on Cut Out + Keep. So thank you Cat for selecting me to be part of this! I’m even interviewed like a famous person might be. I feel fancy. You can read my interview here. Speaking of fancy, did I mention Salted Caramel Maple Nut Clusters? Let’s get back to what’s most important in life, sugary treats. 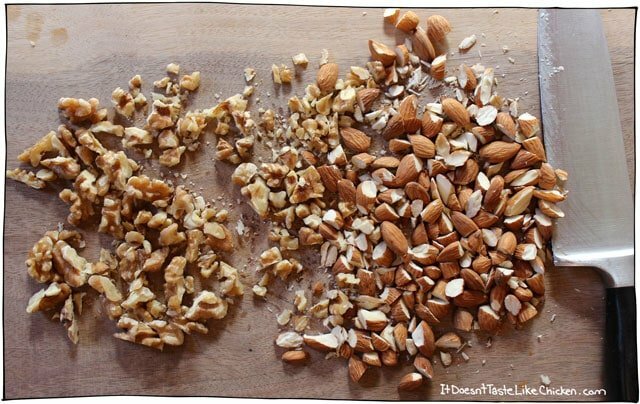 Choose whatever nuts you like. It could be all one type of nut, or a mixture, just so long as it makes 1 cup. Chop up your nuts if they aren’t already. Now add the maple syrup, chili powder (if using), vanilla extract, and salt in a bowl. 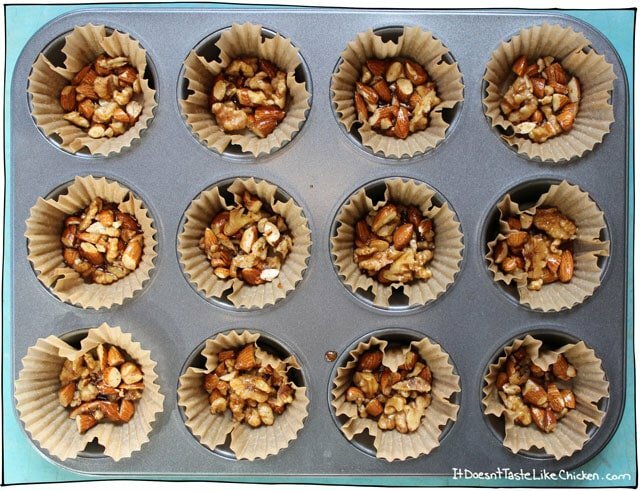 Line a muffin tin with parchment or silicone muffin liners, or use a silicon muffin pan. (Regular paper liners will stick). Divide the mixture evenly among the cups, making sure that the maple syrup liquid is about the same in each cup. You might look down and think, there is now way these nuts are ever going to cluster, but just pat them down with a spoon and trust me on this. Pop them in the oven for 10-12 minutes. The maple syrup will be boiling when you take them out. Sprinkle a bit of flake salt on each one (optional), then let them cool a bit. Pop them in the fridge to finish firming up (just speeds up the process). Store in an air tight container. They will be crunchy the first day, and if they make it to the second day, the will begin to soften up and become chewier. Try to be nice and share with friends. Make no promises. 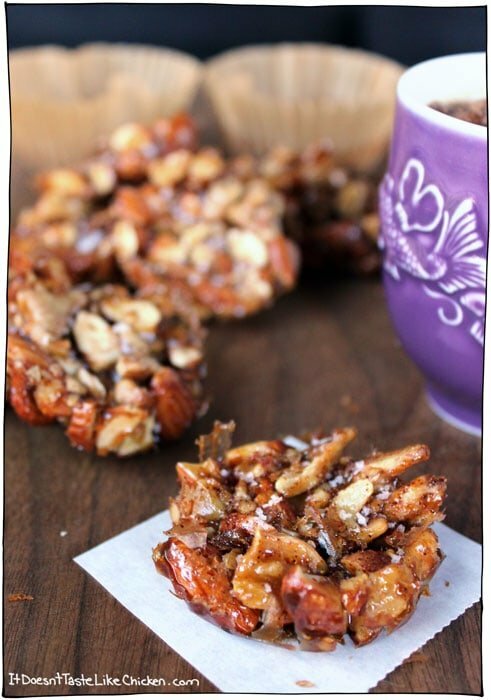 Nutty, salty, mapley clusters = YES PLEASE! Preheat your oven to 350F (180C). Line a muffin tin with parchment, or silicone muffin liners or use a silicon muffin pan. (Regular paper muffin liners will stick). 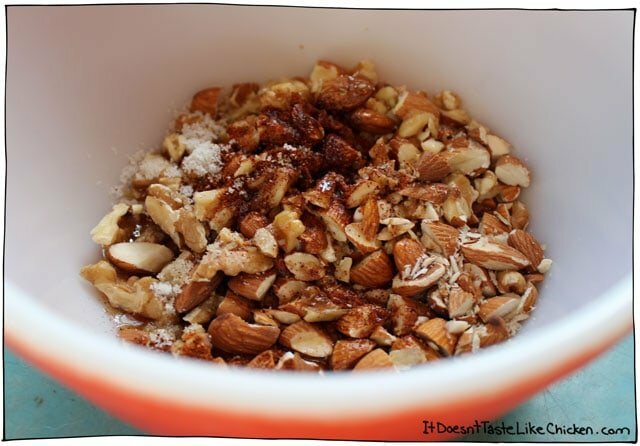 Add the nuts, maple syrup, chili powder if using , vanilla extract, and 1/8 teaspoon (or a small pinch) of salt in a bowl and mix it up. Divide the mixture evenly among the muffin cups, making sure that the maple syrup liquid is about the same in each cup. lightly pat down each cluster with a spoon. Bake for 10-12 minutes. The maple syrup will be boiling when you take them out. Sprinkle a bit of flake salt if using on each one, then let cool completely before enjoying. These also work well with agave instead of maple syrup. Of course then they would be Salted Caramel Agave Nut Clusters. If you go this route, they won't be bubbling when you take the out of the oven, but should look tightened up. I made these with walnuts, almonds, hazelnuts and dried cranberries. They were great!! I can see this will be a new “go to” recipe when I need something quick and easy – and it’s so versatile!! You’re most welcome, Eve. Glad you enjoyed them! So sorry to hear that. The caramel refers to the crunchy caramel flavoured candy coating. I’m thinking of making these soon and I have one question – would they still be good if I substituted some of the nuts for pretzels? They look amazing! Hmmm… my concern is that they might get soggy, since they are baked in a hot liquid. You are welcome to try it of course, but I am not too sure how that would turn out. Enjoy! I tried making these and they turned out like crap. They stuck to the paper. Will never make them again. Oh no! I’m so sorry to hear that Veronica. It sounds like you may have used regular paper lines. The parchment or silicon liners are a must for this recipe or it will stick for sure. Hope that helps! Made these great nut clusters this week. I added vegan chocolate chips to my first batch and 2nd batch added chocolate chips and shredded coconut. Easy to make and love the added chili pepper! My mixture seemed to match your picture perfectly. Should it be really syrupy or just a bit syrupy? I kept them in the refrigerator for quite some time…was this correct? Tried again, this time being very careful with the maple syrup, and it worked like a charm! Do you think these would work with sugar-free syrup? I’ve never really experimented with it and am not sure if it hardens when cooked like real sugars do. I don’t want to waste all those precious nuts! Hi Erin, I’ve never cooked with sugar-free syrup before, but my guess is that it wouldn’t work the same, but that’s just a guess. You could do a test and just make one cookie, if it doesn’t work, just stir the sticky nuts into oatmeal for breakfast. Hope that helps! These are fabulous! I’m so glad I tried them. They’re easy to make and so delicious that I’m trying not to eat them all right now. Thanks for a keeper. Thanks Raven! Sure, feel free, as long as you include a link to the full recipe, I’m a happy camper. (You can see my copyright policy in my sidebar). Thanks for asking! I wonder what it would look like done in a cookie sheet then broken? Would it look like bark or would it be softer and messy? **Waving from the booming metropolis of Napanee! I think it would work if you used a smaller cookie sheet, so that it doesn’t spread to thin, then it would be a bark of sorts. Maybe an 8″x8″ pan? I just got the parchment cupcake liners from my regular grocery store. I’m not sure if regular paper ones would work or not, as I haven’t tried them. I just love the non stick power of parchment! If you do try a different technique, let us know how it goes! They look like little clusters of heaven. Haha, I like that… hmmmm.. recipe rename!! Wow, these look absolutely incredible – and definitely worthy of saving a weekend. 🙂 I have had so many Saturdays like that, where a recipe or a craft I was excited all week to make just went south. So thank goodness for Sundays – and in your case, an extra hour of sleep! Also, congrats on the published piece and selection for Cut Out + Keep! Thank you very much Anne Marie. Don’t you just love it when sweet treats save the weekend!? Works every time! These seem so easy and delicious! Thanks for sharing with us! 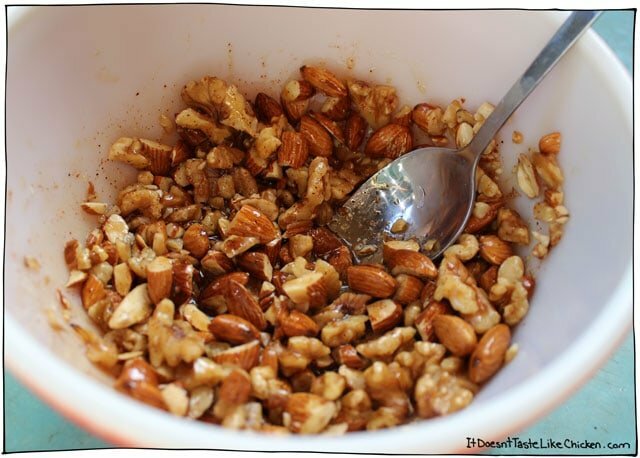 Simple, and nut, and maple, and chili powder- you have all my favorite things in one place!! I can’t wait to make these. And congrats on getting published! Found you via BlogHer. Thank you Stephanie! Oh you are gonna love these. Those are sone if my favourite things too! I love that these are considered paleo! Yummy! Ha! Now all i can visualize is large browed cavemen hunkering over a fire in bare feet, eating these nut clusters. Haha! Haha! As long as you found it, I’m glad! Thank you for loving my blog. It’s a labour of love so it makes my day when it is loved right back. Waving back at you from Toronto! I wonder if this would work with honey. 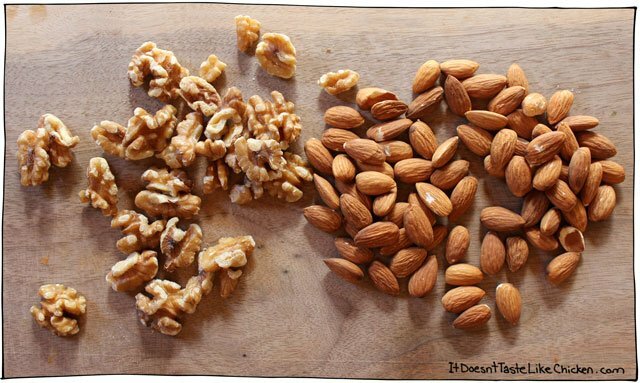 1 cup of each kind of nut, or combined? Thank you, Samantha. I ended up doubling the recipe and eyeing it. Turned out great, everyone loved them! Ready to make more today! Thank you for coming back and leaving a comment, Lilly! Much appreciated. I’m glad they turned out so well for you. And it was my pleasure… so much tasty pleasure. These look super yummy! And congrats on being published – how exciting! Thanks Taylor! Yes, I was pretty super when I was contacted by the Healthy Juicing Magazine people! Getting the vegan word out. Woot woot! OK, so of course these are just adorable and I love how sticky and sweet and indulgent they look but… Sam!!! I am so freaking proud of you I feel like your mom! That is too cool. Can’t wait to see more famousness in the future!! Haha!! Aww thanks Cheryl! That totally made my day! You’re the best! I’m sorry 40 Aprons wasn’t mentioned in the interview, that took place way before I knew about you, or you would have been top of the list. I can’t wait to see more famousness for the both of us!